This past June, Zimbabwe’s government warned street vendors to pack up. Clashes continue as the government promises to clean the streets of all major city centres. Simba Danda, 23, graduated with aBachelors of Accounts degree from the University of Zimbabwe three years ago. His wish was to become one of the country’s top accountants, but that has remained a pipe dream. Danda buys bales of second hand clothes from neighboring Mozambique for resale in Zimbabwe. He wakes up at 5am everyday and carries an old bag full of second hand clothes into central Harare for resale. Danda is one of over a million Zimbabwean street vendors who are facing government eviction from different cities and towns throughout Zimbabwe. They are accused of operating illegally and causing chaos. Currently Zimbabwe city centres especially in Harare have been turned into shanty towns, as jobless citizens line up on the streets selling anything from maize cobs, scrap metals, used cooking oils, second hand clothes daily.Most of these vendors lost jobs following a slew of company closures in the past decade, while others are university graduates who can’t find work, just like Danda. Zimbabwe’s government gave the streets vendors until the end of this past June to leave the streets or face arrest. But the street vendors have resisted this eviction, by demanding President Mugabe fulfill his promise of two million jobs, proffered during his2013 election campaign. Recently Zimbabwe’sCommander of the Presidential Guard, Brigadier-General Anselem Sanyatwe whois part of the feared Joint Operation Command (JOC) told street vendors association leaders in Harare that the security forces would come hard on those resisting the order to move out of the streets. JOC is a grouping of security forces including the army, the state spy agents and the police. Sanyatwe said the army decided to intervene and restore order in urban areas, especially Harare, after vendors invaded all open spaces in the city centre. “I want to warn you, we don’t want to chase each other. We have the powers. Go and address your people and tell them to go to designated places,” Sanyatwe said. Harare alone is estimated to have over 100 000 streets vendors. “We are not going anywhere until the government give us jobs, its better they kill us. I have an accounts degree and was forced into street vending because there are no jobs.They destroyed the economy and now they ban us from selling on the streets.That is just rubbish,” said an angry Danda. Another vendor, Rita Mhembere(40) a widow and mother of the three, said vending is her only source of income and she is prepared to die in the streets. “Even if they bring armed soldiers we are prepared to die. If I stop street vending my family will starve,” said Mhembere. “These Ministers who are saying we should be evicted are living pretty in lash suburbs of Harare and they don’t know how we are suffering, they can go to hell,” she added. According to The Zimbabwe Central Bank, more than 4,000 workers lost their jobs in 2014, while Finance Minister Patrick Chinamasa said 4,600 companies closed down between 2011 and October 2014, resulting in 64,000 job losses. Zimbabwe’s unemployment rate is currently pegged at 90 percent according to the country’s biggest labour union, Zimbabwe Congress of Trade Union (ZCTU). 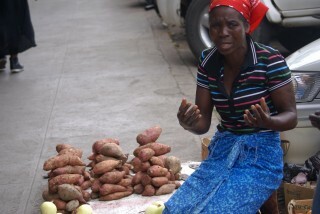 Promise Mkwananzi Director of the street vendors representative body, Zimbabwe Informal Sector Organization (ZISO), described the government’s plans to remove them from the streets as “inhumane”. “It’s very sad that we have a government which does not care about the welfare of its people. Removing vendors from the streets is just satanic and we are not going to allow that. Vending is now the biggest employer in Zimbabwe because of mismanagement of economy by the sitting government. We are not going anywhere, will stay put,” said Mkwananzi. Zimbabwean economists say, unless something drastic happens, 2015 will be another year of economic decline in Zimbabwe associated with the collapse of social institutions and further reduction in the delivery of essential services to the population. Zimbabwe Local Government Minister, Savior Kasukuwere said street vendors will be moved out of the city centres whether they like it or not. “As the government we cannot just watch while our cities and towns are being turned into some shanty towns by these illegal street vendors,” said Kasukuwere. “Remember there are also licensed business people who operate legal in city centres, and right now there are being kicked out of business by these illegal street vendors who don’t pay any tax to government. We cannot allow such chaos,” added the Minister. Under Mugabe’s regime, 72% of the population lives below the national poverty line on less than $1.25 per day according to UN World Food Programme. Zimbabwe’s economy has been on a downward spiral for more than a decade following Mugabe’s land reforms, which broke the country’s agricultural backbone. If Zimbabwe’s government uses force to clear out the vendors, it wouldn’t be the first time. In 2005, riot police were deployed to remove informal traders and demolish backyard buildings, a move that was condemned by the United Nations. The operation, code named “Murambatsvina” or “Drive out filth”, resulted in 700,000 people losing their homes and their source of livelihood, a UN report said.